Live life like a French landlord? That can be done in this beautifully renovated former farmhouse. Detached and perfectly renovated holiday home. 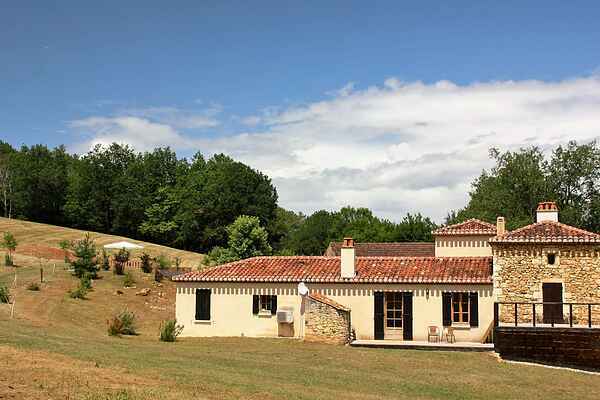 Lovely and peacefully situated near the many attractions of the Dordogne and the Lot-et-Garonne. The interior is very tasteful and comfortable. The beautiful beamed ceilings and fireplace give the house a warm atmosphere. The holiday home comes with its own grounds and has on the south side of the house a comfortable terrace and in the courtyard a nice sheltered spot. You can take a refreshing dip in the round private swimming pool and you can go angling at the private fishing lake. A BBQ is available for a pleasant evening meal! Tennis, bakery, restaurants and a large supermarket in Fumel (3 km). Near Fumel, on the Lot River, you can make a wonderful trip through the valley by car, bicycle or canoe. To see a beautiful piece of history you can visit the medieval castles of Bonaguil (10km) and Biron (22 km). Have a look at the bastide city of Villefranche-du-Périgord (25 km) with a covered market hall where vegetables and fruits from the local area are traded. Swimming lake in Frayssinet (22 km). In Agen (56 km) the themepark Walibi.